With school coming to an end and college starting in the fall, many students are going to need jobs to cover upcoming expenses. 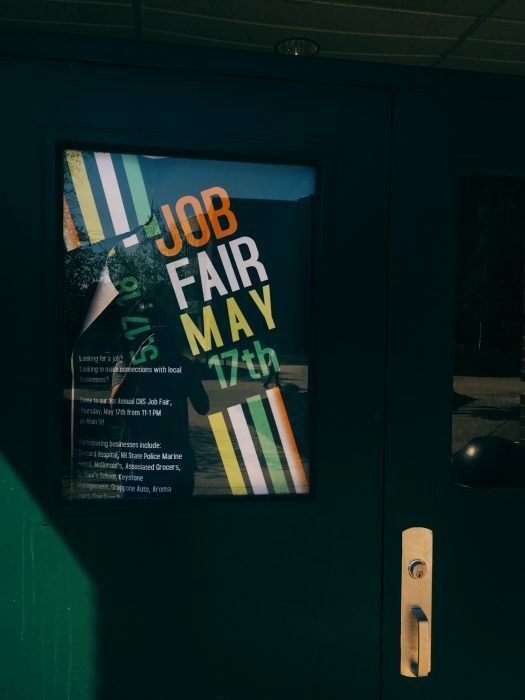 They should definitely attend the Concord High’s first annual job fair Thursday, May 17, from 11 a.m. to 1 p.m. on Main Street. About two dozen businesses registered to attend “and are looking for employees,” said Sara Hans, a teacher who is one of the organizers of the event. “We have attempted to hit a variety of career fields which fall in the following career pathways: hospitality/ tourism, construction, transportation, distribution and logistics, health sciences, laws, public safety, corrections and security to name a few,” she said. Guidance counselor Rebecca Schaefer, another organizer, said the following businesses will take part: Age at Home, Aroma Joe’s, Associated Grocers of New England, Bow Youth Center, Concord Hospital, ConcordTV, Five Guys Burgers & Fries, Genesis Healthcare @ Harris Hill Center, Grappone Automotive Group, Interior Design Degree and Certificate Program at MCC, J.Jill, Job Corps, McDonald’s, McLane, N.E. Regional Laborers Apprenticeship Program, New Hampshire Department of Administrative Services, New Hampshire National Guard, New Hampshire State Police, New Hampshire JAG, St. Paul’s School, Home Depot, New Hampshire Department of Transportation, PeopleReady Skilled Trades, Keystone Management, Sports Clips Haircuts. “Students looking for employment should wear interview attire, a resume (if they have one) and be prepared for interviews,” said Hans.